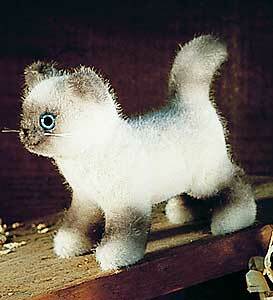 Kosen Birman Kitten is made of the finest grey and white plush, with blue and black eyes. Number 4451, Standing, Safety eyes, Synthetic filling material, Surface washable only. Approx. Size 14cm width. 11cm Tall.